denly extends the claws and startles its enemy. and feasts on the eggs that are left behind. of darkness, waiting to attack its prey. nests and steals eggs for food while the parents are away. 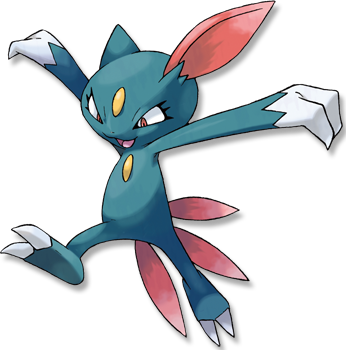 Emerald A SNEASEL scales trees by punching its hooked claws into the bark. It seeks out unguarded nests and steals eggs for food while the parents are away. FireRed Vicious in nature, it drives PIDGEY from their nests and feasts on the eggs that are left behind. Leaf Green Its paws conceal sharp claws. If attacked, it suddenly extends the claws and startles its enemy. Diamond/Pearl It is extremely vicious and will not stop attacking until its foe is incapable of moving. Platinum A smart and sneaky Pok�mon. A pair may work together to steal eggs by having one lure the parents away. Heart Gold Its paws conceal sharp claws. If attacked, it suddenly extends the claws and startles its enemy. Soul Silver Vicious in nature, it drives PIDGEY from their nests and scavenges any leftovers it can find. Black A smart and sneaky Pok�mon. A pair may work together to steal eggs by having one lure the parents away. White A smart and sneaky Pok�mon. A pair may work together to steal eggs by having one lure the parents away.